A Stealth Boy is a portable cloaking device, and you can become invisible for a short time with the help of the gadget. 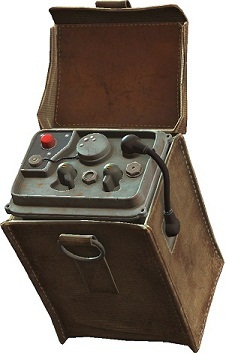 The device is known from the other titles of the Fallout series such as Fallout: New Vegas. Therefore, it is ideal for sneaking pass powerful and gigantic opponents. We show you below where to find the useful Stealth Boys. The companion Deacon is the master of camouflage and thus perfect if you want to play tactical and logical fights. Once you have maximized the relationship with him, you’ll get the perk "Cloak and Dagger." Which add 20 percent more damage from stealth. In addition, your Stealth Boys hold 40 percent longer, so a whopping 42 seconds! Furthermore, the Stealth Boy is also use in power armor. To help you make not only invisible, but also reduce the weight of the armor. This only works if you unlock a perk in the skill tree. You'll find it at the intelligence level 6. The ability is called "science" and enabled you to access standard and rank-1 high-tech mods. - The bosses Kellogg has a Stealth Boy. If you defeat him, the Stealth Boy is yours. You meet him in the command center of Fort Hagen on Kellogg. - Go into the Boston Public Library, you find a Stealth Boy in a locked room. - In Wattz Consumer Electronics you have to go one floor up. There you will find a locked room (expert required!). The gadget is on a shelf. - The next Stealth Boy can be found in Boston Mayoral Shelter. Go to the tunnel leading to the entrance of the shelter. On the right side is a skeleton of a soldier, in which you'll find the Stealth Boy. - In the secret part of the Vaults 81 you will find another Invisibility gadget. Here you have to look on the desk of the medical room to find it. - In the castle, situated in the far west of the map. There you will find two Stealth Boys behind a large metal door. - In National Guard Training Yard, you have to go to the second floor to find the gadget. It is located in barracks. - Go to Federal ration Stockpile. At the first intersection of the corridors you walk to the right. Then go down the stairs and jump over a small gap. Here you can find a room full of skeletons and a Stealth Boy. - Once you enter into the building, Backstreet Apparel, you take the first passage on the left. There you can see a door that leads to the broom closet, but it is blocked. You have to open it to get the gadget. - In the factory arc jet system you can collect another Stealth Boy. Go to the first floor of the factory arc jet system, behind a door that you have to open. Here you will find a collapsed area in which you come to either the second or into a room on the first floor. Run to the end and get the Stealth Boy. - The last Stealth Boy can be found in the Park Street Station. Just go down the stairs. There you will find a door on the left react by guessing. In the space behind it is a safe, which can be unlocked only with special skill.